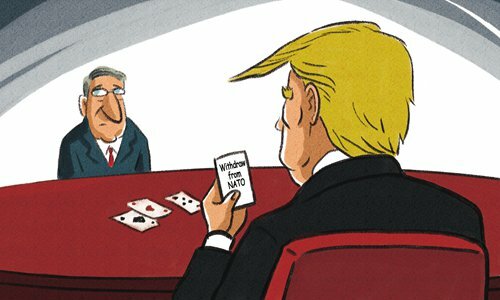 Over the course of 2018, US President Donald Trump privately told his advisers many times that he would consider pulling his country out of NATO if other members did not change the military alliance's policies, especially increasing their military budgets. Once he even claimed that the US alliance with NATO is "costing us a fortune." Although this may probably be Trump's bluff and bluster, it will deal a huge blow to NATO unity and US leadership. Retired Admiral James Stavridis said, "Even discussing the idea of leaving NATO - let alone actually doing so - would be the gift of the century for Putin." Trump's words have already upset NATO's agenda. This year marks the 70th anniversary of the establishment of the US-led military alliance, but a celebration meeting planned for April in Washington has been downgraded to a foreign ministers' gathering, and will not take place in the US capital. Since former Defense Secretary James Mattis left his post at the beginning of this year, people have been more worried about the possibility of US abandonment of NATO. In a warning to Trump not to try to suddenly withdraw from NATO, the US House of Representatives on January 22 approved legislation by a bipartisan 357-22 vote. Although it has no legal binding now, it will certainly constrain the president's act to some extent. The reason that Trump can play this "withdrawal" card is that US domestic and international laws have loopholes. The US Constitution empowers the president to propose and negotiate agreements with countries, and the Congress has the right to approve them. However, the Constitution does not include the procedure to dissolve a treaty, making this right fall under the control of the president. NATO allies did not expect the issue either. According to Article 13 of the North Atlantic Treaty, "any Party may cease to be a Party one year after its notice of denunciation has been given to the Government of the United States of America, which will inform the Governments of the other Parties of the submission of each notice of denunciation." But Trump himself may not care about the result. He plays the "withdrawal" card at will, and his purpose is simply to cause a stir.